Leaving aside yesterday's moan-fest for a minute: last week when I had about an hour in which to clean the house before friends turned up for a lunch party I thought "Forget that!" 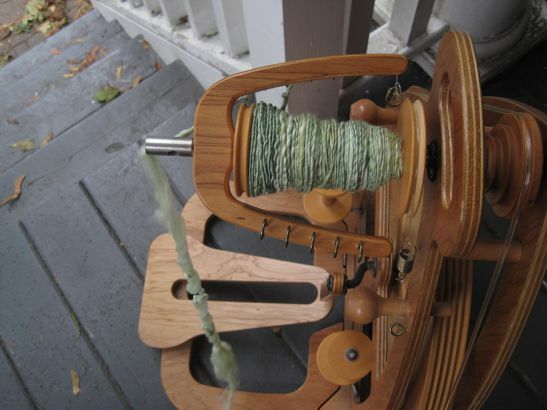 and snuck off to pull out my spinning wheel. It's probably three years ago now that I was a knitter resisting learning to spin, because it seemed like another deep pit of distraction and expense. That's sort of a deceptive impression. Spindles can be cheap, like the Ashford learner one that cost me less than $20 and works just as well as the more beautiful one I bought later whose price we will not discuss, ahem. They can even be free, as when you make them yourself. You can do that from found items, especially if you can face a bottom-whorl spindle and have the wherewithal to glue a bead to a crochet hook. 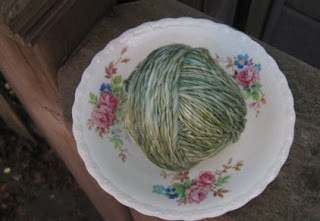 And even roving costs about half what yarn does, so in a way you save money when you spin. Of course it doesn't take long spinning with a spindle to see the upside of going veryveryfast, for which you need a wheel, and wheels are definitely not cheap. (Mine is an Ashford Joy, purchased used - it was still pricey, and still worth every penny to me.) Plus, even with a wheel it takes time to spin yarn, after which you need to do something with it or it will just take up space in your stash. So as I say - I was kind of right to avoid learning to spin. But on the upside, it is an incredibly peaceful art that more than gives back what you put into it. It's a good thing to do to calm down out of the flurry of guest-anticipation and be ready to enjoy your visit. Especially if your guests are the sort who aren't going to mind if you pull the wheel out again after lunch and fuss over your bamboo blend fiber while you chat. I don't know how this is going to look plied; the singleton is super fat, and super overspun. But it was ever so nice in my hands and I think it will feel nice on somebody's neck or head... eventually. If you single is fairly thick, you can tie the yarn in a hank, wet it thoroughly and dry it hanging, with weights. That way you have a fairly stable single and you can knit with it, without plying. If you carefully *felt* the yarn a bit while you wash it (enough to hold the fibers in the single, without bonding the strands together), you'll have a permanently stable single (Like Noro). It looks beautiful, by the way.